Buy Fellowes 53C Powershred Coss Cut Shredder in Sharjah, Dubai, Abu Dhabi UAE. An essential shredder for any home or home office, the Fellowes Powershred 53C comes equipped with SafeSense technology, automatically shutting down the shredder if hands come into contact with the paper entry – ideal for the home environment. As a security level DIN P-4 cross-cut shredder, the Fellowes 53C is ideal for securely shredding documents like home utility bills and your bank statements. It shreds them into small 4 x 35 mm cross-cut particles, making it extremely difficult for someone to piece back together and read, giving you the peace of mind that you are better protecting yourself and your family against identity fraud. The 53C has been designed for individual users and can shred up to ten sheets of paper per pass, so is perfect for your all your home shredding requirements and is tough enough for more moderate use. It shreds non-stop for up to six minutes and has a 23 litre bin. The compact, stylish design of the 53C takes up little space in your home or home office. Neatly place it next to your desk or even under it so it is always available for use. Fellowes knows it's not just identities that need protecting. 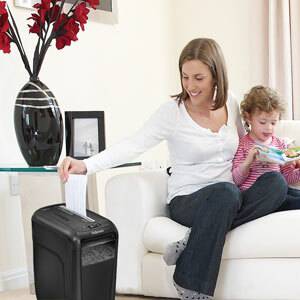 The Fellowes Powershred 53C comes with the family-friendly SafeSense technology feature. SafeSense works via an electronic sensor that surrounds the paper entry, automatically disabling the shredder when hands come into contact with the paper opening and stopping the shredding process immediately. The 53C comes with a 23 litre bin with a handy window so you can see when the shredder is getting full. The bin has a lift-off head that is easy to remove, making bin emptying fuss-free!It's not just paper that needs to be disposed of securely. 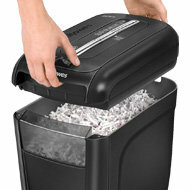 The Powershred 53C is also tough enough to shred unwanted credit cards and will also accept paperclips and staples.